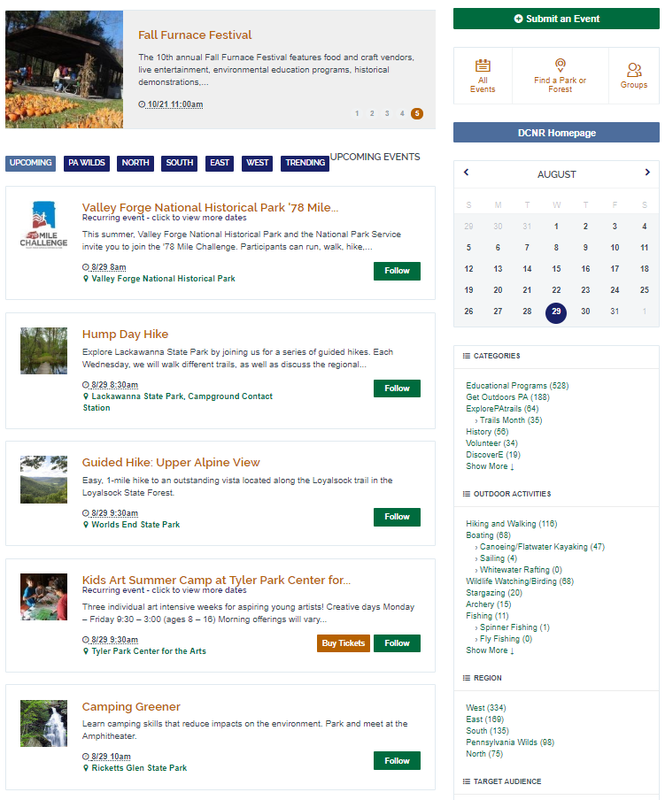 If you’re already a DCNR Calendar of Events user, log in. If you’re not yet a DCNR Calendar of Events user, sign up. Enter your Event. Include Meeting Place, Difficulty, Length of Hike, and your contact information in the Description. IMPORTANT! Make sure you select ExplorePATrails as the Category. If you don’t, your event will not be displayed on the Calendar page. If you are entering a Hiking Week and/or National Trails Day event, those categories can be selected under the “Seasonal Event” heading. Click Add Event. Your event should be visible on the Calendar page within five business days. If you don't see your event, log in again at http://events.dcnr.pa.gov and click the “Me” link at the top of the page.